As the fundraising arm for the Rehabilitation Centre for Children and the SSCY Centre, all money raised is re-invested the needs of the children who access services at the centres. Our vision is for all children to have the support required to realize their abilities. Children with disabilities should have the same opportunities as other children to learn, play and grow. Your support of the Children’s Rehabilitation Foundation helps us provide specialized equipment, modified leisure activities and clinical services to help them do so. From lightweight wheelchairs and specialized strollers, to customized bikes and communication devices—we purchases a wide range of equipment for children and families not funded by any other source. Every piece of equipment is customized to each child’s specific needs, and therefore, can come at a high cost. We receive hundreds of requests for equipment from Rehabilitation Centre for Children’s therapists and specialists every year as each piece is crucial to providing as much independence as possible. As technology progresses and children’s needs grow more complex, it’s vital for Rehabilitation Centre for Children staff to have the proper equipment to assess and treat children. We fund capital equipment—everything from adapted bicycles to communication iPads—that is used in the centre’s occupational therapy, physical therapy and medical appointments. The Take-Out-Toy Services (TOTS) toy lending program has more than 400 toys designed for the development and growth of children with complex needs. The Leisure in Fun Environments (L.I.F.E.) program provides a wide range of recreational opportunities for children with disabilities. 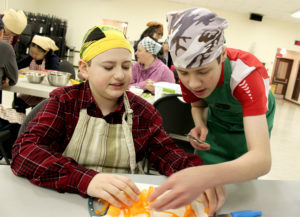 Some of the activities within the program include summer day camps, music therapy, a ‘Saturday Night for Teens’ club, art therapy, cooking clubs and much more. It can be incredibly difficult for families to find recreation opportunities suitable for their child’s needs. The L.I.F.E program fills that void. Every activity is modified to fit the special needs and skill levels of each child. This program, which is funded entirely by Children’s Rehabilitation Foundation, is incredibly beneficial for children and youth with disabilities. It teaches them valuable life skills, social skills and, most importantly, allows them to have fun! The goal of the Active Living Program is to promote a healthy lifestyle by making it easier for children with disabilities and their families to increase their recreation and physical activities at home, school and in the community. Children, their siblings, and parents can enjoy a variety of fun outdoor activities together by borrowing adapted specialized recreation equipment at no charge. Activities and equipment provided by the Children’s Rehabilitation Foundation include bocce ball, bowling, swimming, biking. The Children’s Rehabilitation Foundation’s semi-annual Bike Days allows children to test our specialized bikes with a team of occupational and physiotherapists. Due to physical or cognitive challenges, some children are unable to speak and need extra help expressing their wants and needs. The Specialized Communications Resources for Children (SCRC) is a department within RCC that is staffed by speech language professionals who are committed to helping children learn to communicate in alternative ways. The department—which is funded entirely by the Children’s Rehabilitation Foundation—uses innovative technology and coaching methods to teach parents how to communicate with their children, which in turn helps children learn how to communicate back. More than 150 bikes are designed and modified inside the Rehabilitation Centre for Children’s W.A. Laddie Hutchison Bike Clinic each year by a team of engineers, occupational therapists and clinical technologists. 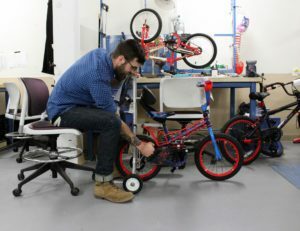 The multidisciplinary team uses the newest technologies to design and modify standard bikes to give children living with disabilities the opportunity to ride a bike. The Feeding Clinic, an interdisciplinary team of doctors and specialists who operate out of the Rehabilitation Centre for Children, provides a comprehensive clinical assessment for children experiencing feeding difficulties. The Children’s Rehabilitation Foundation funds equipment that is used in the Feeding Clinic to demonstrate food preparation for parents, as well as special eating utensils for children who are learning the motor skills needed to feed themselves. The Children’s Rehabilitation Foundation believes in making a child’s rehabilitation experience as positive as possible. That’s why we fund special decals that can be applied to a child’s prosthetic and orthotic devices. These fun and bright decorative items help personalize the prosthetics and orthotics in hopes that children will wear their assistive devices with positive attitudes. The Rehabilitation Centre for Children promotes excellence in the field of paediatric rehabilitation through hands-on research focused on enhancing care and evaluating barriers that restrict inclusion of children with disabilities. We fund a part-time research coordinator position at the centre who collaborates with local and national researchers in the field of childhood disability.